Every piano whether old or new has the tendency to get out of tune in time. Because of the impact generated by the hammers in the piano action, the strings will in time become loose, thus compromising the tonal quality of the piano. 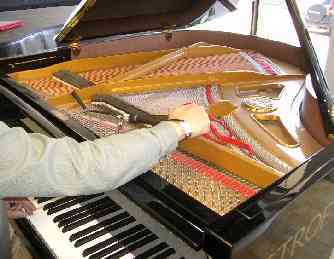 So It is important that your piano be tuned regularly to maintain it at the internationally accepted A440 pitch. When your piano is left untuned for several years, it would be difficult to tune it back to its original pitch. Aside from tuning, voicing and regulation which are lengthy processes of adjustments in the shape and density of the hammer felt density/hardness and re-alignment of uneven hammers and dampers in the action may also be required every few years in order to maintain optimal tonal quality of the piano.To ensure the highest sound quality in your piano, we recommend that your piano be tuned at least 3 or 4 times the first year, as a new environment causes the piano to go out of tune easier. After the piano settles, you may have it tuned twice a year. Good times to tune your piano are Spring and Fall, about a month after you have turned off your heating or cooling systems.